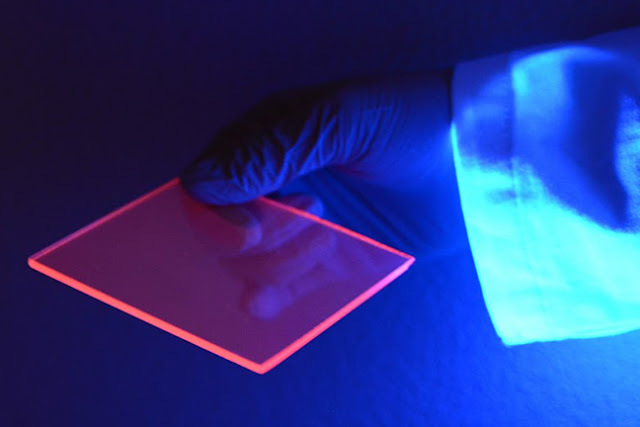 Researchers at the University of Minnesota and University of Milano-Bicocca are bringing the dream of windows that can efficiently collect solar energy one step closer to reality thanks to high tech silicon nanoparticles. The researchers developed technology to embed the silicon nanoparticles into what they call efficient luminescent solar concentrators (LSCs). These LSCs are the key element of windows that can efficiently collect solar energy. When light shines through the surface, the useful frequencies of light are trapped inside and concentrated to the edges where small solar cells can be put in place to capture the energy. While most of the light concentrated to the edge of the silicon-based luminescent solar concentrator is actually invisible, we can better see the concentration effect by the naked eye when the slab is illuminated by a “black light” which is composed of mostly ultraviolet wavelengths. The research is published in Nature Photonics, a peer-reviewed scientific journal published by the Nature Publishing Group. Windows that can collect solar energy, called photovoltaic windows, are the next frontier in renewable energy technologies, as they have the potential to largely increase the surface of buildings suitable for energy generation without impacting their aesthetics—a crucial aspect, especially in metropolitan areas. LSC-based photovoltaic windows do not require any bulky structure to be applied onto their surface and since the photovoltaic cells are hidden in the window frame, they blend invisibly into the built environment. The idea of solar concentrators and solar cells integrated into building design has been around for decades, but this study included one key difference—silicon nanoparticles. Until recently, the best results had been achieved using relatively complex nanostructures based either on potentially toxic elements, such as cadmium or lead, or on rare substances like indium, which is already massively utilized for other technologies. Silicon is abundant in the environment and non-toxic. It also works more efficiently by absorbing light at different wavelengths than it emits. However, silicon in its conventional bulk form, does not emit light or luminesce. 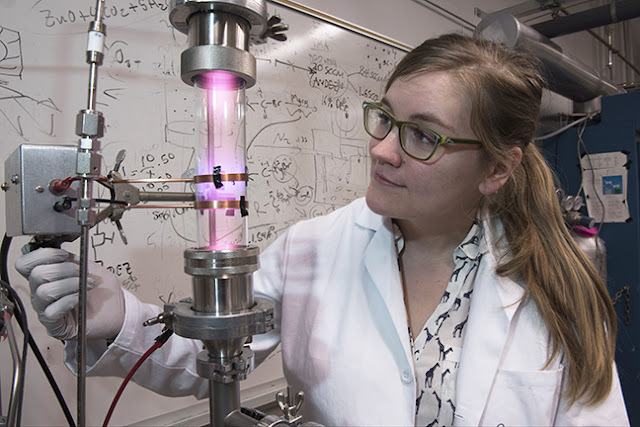 University of Minnesota researcher Samantha Ehrenberg uses a plasma reactor to create silicon nanoparticles that are the key ingredient in the solar concentrators. Using the silicon nanoparticles opened up many new possibilities for the research team. Researchers say the optical features of silicon nanoparticles and their nearly perfect compatibility with the industrial process for producing the polymer LSCs create a clear path to creating efficient photovoltaic windows that can capture more than 5 percent of the sun’s energy at unprecedented low costs. “This will make LSC-based photovoltaic windows a real technology for the building-integrated photovoltaic market without the potential limitations of other classes of nanoparticles based on relatively rare materials,” said Francesco Meinardi, physics professor at the University of Milano-Bicocca and one of the first authors of the paper. The silicon nanoparticles are produced in a high-tech process using a plasma reactor and formed into a powder. The University of Minnesota invented the process for creating silicon nanoparticles about a dozen years ago and holds a number of patents on this technology. In 2015, Kortshagen met Brovelli, who is an expert in LSC fabrication and had already demonstrated various successful approaches to efficient LSCs based on other nanoparticle systems. The potential of silicon nanoparticles for this technology was immediately clear and the partnership was born. The University of Minnesota produced the particles and researchers in Italy fabricated the LSCs by embedding them in polymers through an industrial based method, and it worked. Funding for the research study includes a grant from the U.S. Department of Energy (DOE) Office of Basic Science Center for Advanced Solar Photophysics, an Energy Frontier Research Center and a grant from the European Community’s Seventh Framework Programme. Ehrenberg also received funding from a National Science Foundation (NSF) Fellowship and the Benjamin Y.H. and Helen Liu Fellowship. Citation: “Highly efficient luminescent solar concentrators based on Earth-abundant indirect-bandgap silicon quantum dots” Nature Photonics website.